Fan favorite David Wong takes readers to a whole new level with this blistering sequel to the cult sensation John Dies at the End, soon to be a movie starring Paul Giamatti Originally released as an online serial where it received more than 70,000 downloads, John Dies at the End has been described as a "Horrortacular", an epic of "spectacular" horror that combines the laugh out loud humor of the best R-rated comedy, with the darkest terror of H.P. Lovecraft. The book went on to sell an additional 60,000 copies in all formats.As the sequel opens, we find our heroes, David and John, again embroiled in a series of horrifying yet mind-bogglingly ridiculous events caused primarily by their own gross incompetence. The guys find that books and movies about zombies may have triggered a zombie apocalypse, despite a complete lack of zombies in the world. As they race against the clock to protect humanity from its own paranoia, they must ask themselves, who are the real monsters? Actually, that would be the shape-shifting horrors secretly taking over the world behind the scenes that, in the end, make John and Dave kind of wish it had been zombies after all. 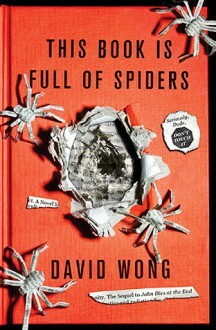 Hilarious, terrifying, engaging and wrenching, This Book Is Full of Spiders, the next thrilling installment, takes us for a wild ride with two slackers from the midwest who really have better things to do with their time than prevent the apocalypse.